Well hello there! Yes, it has been a while… a LONG while. there’s a good reason though, and that reason is that 2016 was crazy busy. I had the busiest year by far out of my seven years of longarm quilting for the public! Like 140% of business compared to the prior year! This has all been a good thing, because things happened: I paid off a student loan, I put money in savings and CD’s for my girls, and I sort of learned to say no. Most importantly, I had an intervention with some quilty friends at retreat. They sat me down (more than once) and explained how important I am. That I have value, and that I need to make time for ME. So that’s the plan. This year is all about balance, and about keeping myself as a top priority on my to-do list. Last year I had quite a few friends that made resolutions to finish UFO’s, to not buy new fabric, to not start new projects but finish their old. My resolution (if you want to call it that) this year will be to start new projects! Ha! I would like to say one per week, but I think one per month is more realistic. There is another fuel propelling me towards this goal: I went a little crazy on buying fabric over my holiday time off. I mean like, $6-700 crazy. It’s been a long time since I really went on a spree to buy anything just for me. Usually it’s something to finish customer quilts, bolts of black, or stabilizer. Not necessarily the fun stuff. When I got home and had the opportunity to fondle my purchases, I decided to see if I had some things in my stash to match or coordinate with my new things. I was appalled. 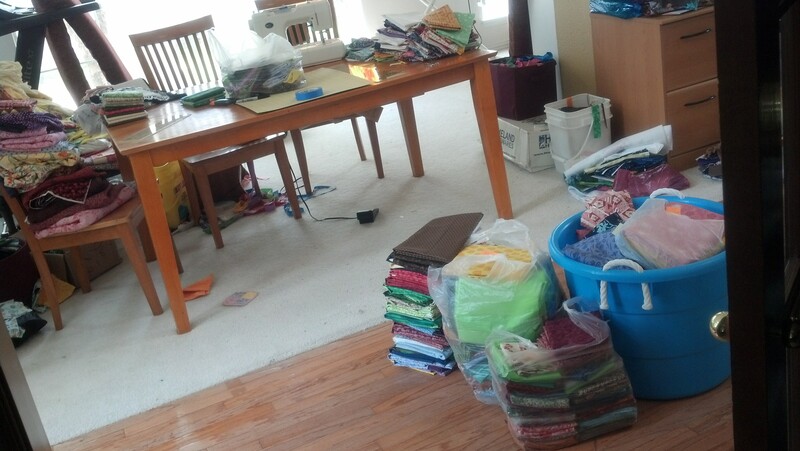 Absolutely embarrassed by the amount of fabric I have hoarded, yet at the same time, I can’t stop. I cannot stop buying beautiful fabrics within which I see great potential for beauty when combined in the right group with other fabrics and a great pattern. The interesting thing is that I noticed that my fabric tastes have changed. I purged a lot of fabrics over the past few years that were cottagey, boho chic, sort of floral in favor of marbles, solids and blenders, with colors being the opportune eye catcher of the quilt. Interesting to note, at least for me. I have also picked up quite a few black and white prints. What to do? USE IT. I need to make things. Well, not just things, but QUILTS. So today I started. Actually it was yesterday. I set out some focus fabrics on my table and some fabric groups. But today I cut fabric from three sets into ‘kits’ that will work with the patterns I chose for them. I’m having surgery next week, and I figure I may not be able to cut or quilt or do heavy lifting, but I could certainly sit at the machine and piece. if you love fabric, buy it. eventually you will use it or give it to someone that will. use it, and use it now. don’t save the stuff you love for another day. a friend of mine said she knew a lady that did just that, and suddenly went blind, so could no longer play with her favorite fabrics she has saved. start new projects. if you have UFO’s you can’t get back to, give them to someone at your guild, or in a friendship group. It may just become a cherished, and finished project. I’m a scrapper, so I use a lot of them in quilts and just love the way scrappy quilts look. If you aren’t a scrap saver, give them to someone who is. They will find a good use for the fabric! If you do applique or postcards, the smallest piece of fabric is often still usable. So, like I said, for me this year is about balance. Balance, meaning I will find time for the gym, to cook some dinners, and most importantly, to make some quilts that I want to make. That does mean that my business goals are less aggressive, financial goals less skyward, but in exchange my happiness level should be stable, achievable, and daily. AND less stress to boot! Essentially, this is a re-evaluation of my measure of success. This past year was about driving my income over and above the year before. OK, check that off, done. This year, that’s less important than finding peace with a balanced lifestyle, and a holiday season that isn’t overwhelmingly busy to the point of no time for family. I’m quite excited for this new year. I hope you are too! Happy quilting my friends! My name is Maria and I have a problem. I am a fabricaholic. I’m a junkie. An addict. And no, I’m not poking fun about addictions. This is real, just as real as any other addiction that a person is consumed with, feels the need to feed and then hide it from others. I’m addicted to fabric. It’s not shopping, that’s not the problem. It’s that I feel the NEED to OWN every beautiful piece of fabric I come across, knowing full well that someday that will turn into the most amazing finished project. But I have collected so many of these ‘potential projects’ that I can barely find one stacked under all the others. 2 years ago I bought the tiny twister and I STILL can’t find it! I love fabric. I love the vibrant colors, coordinating patterns, the smell of the dyes, the feel of good quality cotton between my fingers. I love looking at each piece individually and imagining it’s potential, and how beautiful I could make it. Pause for a deep breath. Ok, better now. Let’s keep going. I first started to realize that I had this problem when I looked at my expenses and income for last year. The amount of money I spent on fabric was literally insane = I had NO business spending that much on ‘possibilities’. So this year I put myself on fabric hiatus. I told myself no spending on fabric unless it was for a customers quilt, AT LEAST until I had worked my stash down some. That’s when I started really getting busy making some charity quilts. I ended up so busy with customer and other charity work that I really only finished 2 charity quilts, start to finish so far. I have another one almost done, but obviously 3 small quilts didn’t even make a millimeter dent in my stash. Let’s make sure we’re all on the same page here… These bins contain, no that’s not the right word. 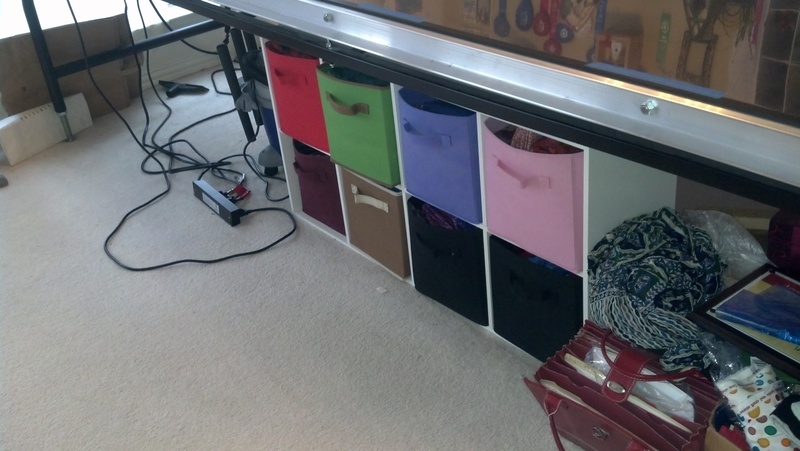 These bins are STUFFED to the brim with fabric in a color similar to the bin itself, to help me stay organized (notice there’s 4 blue bins!). 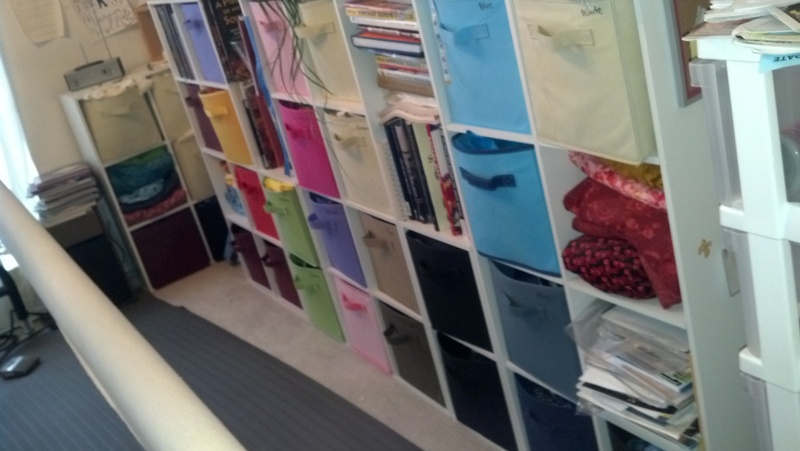 Many of the bottom bins, as well as the cubbies with no bin, hold excessive yardage of fabrics that I was SURE would be used as a beautiful backing someday. The bins below are additions I (sigh) had to buy because these bins above were already full. And there are two more behind me, not in the picture. Most of these contain my newest additions = batiks. And finally, my, um… table. The blue bin tucked under the white and yellow repair quilt is full of quilt tops I’ve made but have yet to quilt. The green bag next to that is full of fabric, as is the small plastic bag next to it. The table holds not only a printer (can you find it? ), but fabric, a bag full of strip scraps, a bag of clothing sample squares (for a replica quilt I’ll make someday), the woven basket FULL of vials of beads (my next venture, after I make all these quilts from my stash..), fabric in the box, behind the box, a pillow I made with fabric under it and behind it. And on it. I was just coming clean with my husband about all this. He called me a hoarder. But at least he said it in a nice way. I was recently informed that I could participate in the annual garage sale at the local quilt shop. This means I can bring in any quilt or sewing related items to sell. I decided it was time to come clean and stop hoarding. I measured all my finished quilt tops and I think I have 15. I also have 3 with backing ready. Then it was time to hit the bins. You can see Fred in the background. I think he was scared. 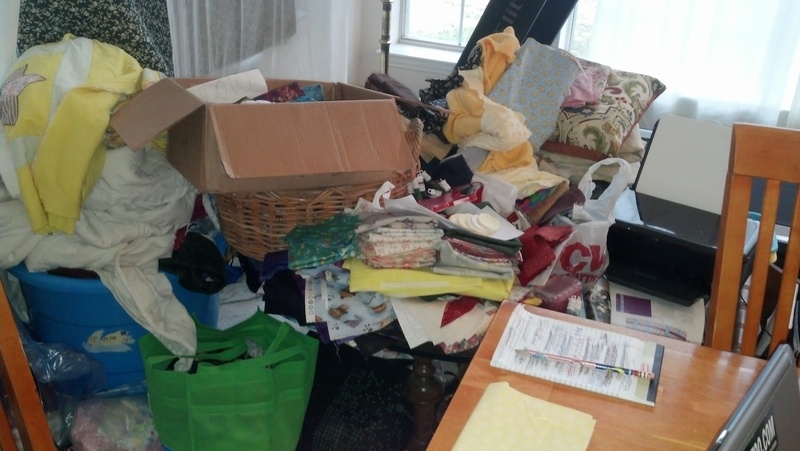 I started with my bags of fabric sitting over to the side, and then grabbed what I could bin by bin. I measured and cut yardage, 1 yard pieces, 1/2 yard pieces, fat quarters and some ‘charm packs’. I had fabric from the very first quilt I ever made (like 13 years ago?) and some I’d bought 3 years ago and hadn’t seen since. Time for it to go! I made a lot of progress yesterday going through all this. The blue tub holds quilt tops, yardage, 2 charm packs and a kit and book. The bags on the floor hold the yard and 1/2 yard cuts. On the table are more 1/2 yard cuts and the fat quarters and some squares I cut to make charm packs. In the chair to the left is more fabric I still have to work on. And I still have about 10 bins to go through. It was nice to touch each piece I had collected. 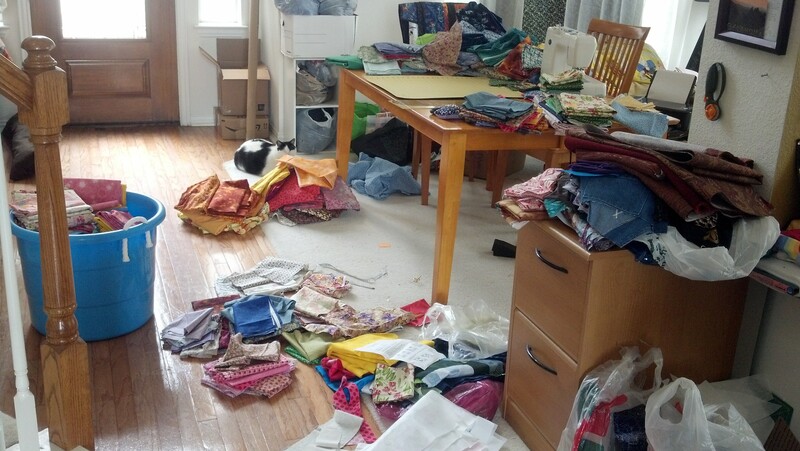 My stash is quite varied, and some of the fabrics looked ugly next to others in the bin where they were stored. Being a fabricaholic, of course NO fabric is really ugly. I was able to see each piece’s potential and beauty again as I caressed it. sigh. I have a lot of scraps from all this, but most of what I make when I go on retreat is scrap quilts. So that’s not a bad thing – I look at it like I’m getting to keep a little piece of each fabric. Like a memento. This really is a win-win situation. I either sell a lot and come home with $, or I don’t sell it and I get to bring it back home.